I have been baking a lot lately, mainly with yeast. But stuffed buns were something I had never attempted before. I started experimenting recently and was very happy with the outcome. For breakfast, at teatime, or as an anytime snack, these stuffed buns are fantastic! They are good on their own but I make hummus pretty regularly now and I often reach for the jar in the fridge when I snack on a stuffed bun. Heat 1 cup of water. You should be able to dip your finger in it. Add the yeast and the sugar in a bowl. The sugar will activate the yeast. Pour the water, give it a stir and set aside till the mixture froths up. This may take about ten minutes. Transfer the flour to a large bowl. Add the dried herbs and mix. Drizzle the oil on the mixture. I must have used about 3 tablespoons. Make a well in the centre. Pour the yeast and start to mix. Sprinkle some salt and mix again. Tip the contents on your worktop and knead for about 10 minutes. Grease a bowl and transfer the soft and pliable dough into it. Cover with a kitchen towel and put it in a warm place till the dough doubles in size. This will take about an hour. Knead the dough lightly for a few minutes then shape them into balls. Take one ball and dust your rolling board with flour. Roll out the dough large enough to hold the sausage. Smaller shapes look better but I happened to have the longer sausages. 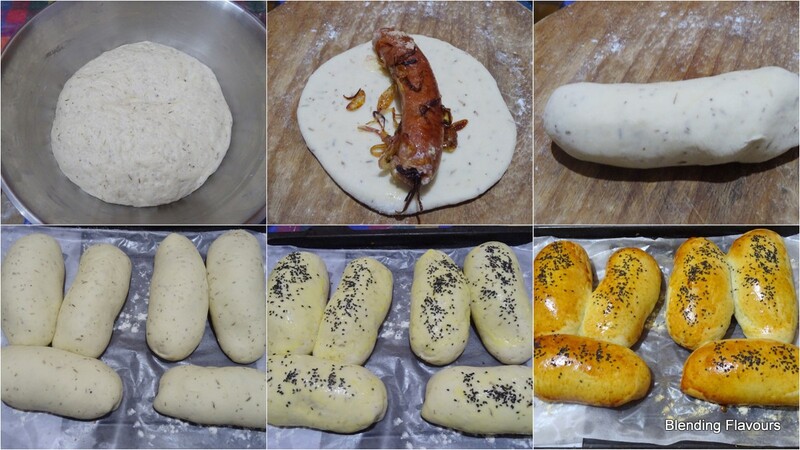 Place one sausage on the rolled-out dough with a sprinkling of onions and pepper if you wish. Roll up the dough encasing the sausage. Dab some water on the ends and seal any openings. Place on a greased tray with the folded ends touching the tray. Repeat with the remaining dough. Cover and leave to rise. Preheat the oven at 180C. Brush each bun with egg wash and sprinkle them with sesame seeds. Bake for 20-25 minutes till the buns turn golden. Remove and cool. These buns taste best when they are still warm.